Let me preface this by saying (Imperial) Red ales aren’t my favorite style of beer. AleSmith’s Yule Smith (Winter) is an Imperial Red. AleSmith releases two different versions of Yule Smith, this one in the Fall/Winter and another in the Summer (Christmas in July! ), and Imperial IPA. Winter and Summer aren’t used on either label, but the images on the label should make it obvious which is which. (So be careful if you’re picking up a bottle at a shop that isn’t good about selling through their beers, I’ve seen Summer Yule Smith on shelves well past it’s prime). For a style of beer that isn’t my favorite, Yule Smith is pretty good. 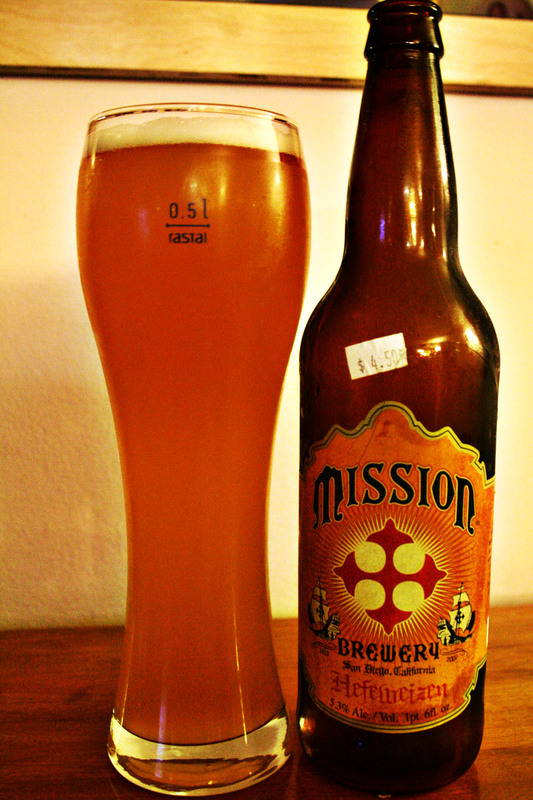 The piney, citrus like hops are apparent as soon as you start to pour from the bottle to a glass. 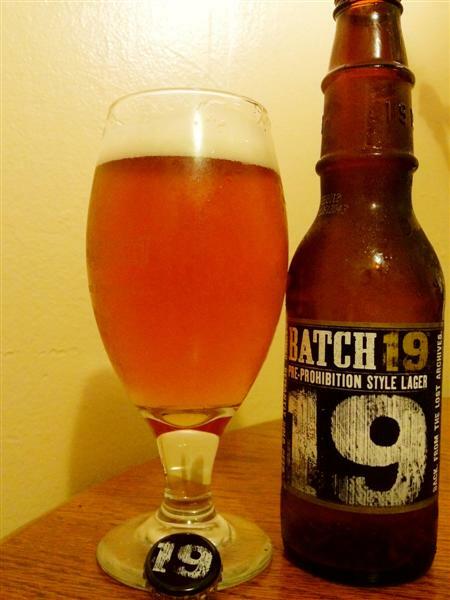 The initial taste is dominated more with sweet, caramel like malts than the hops. The hops come next, pine and grapefruit really stand up to the sweet malt to balance things out — balance might not be the right word. Technically the big hops balance out the big malt so neither dominates the flavor, but balance just doesn’t feel like the right word. One thing that detracts from my enjoyment is the high alcohol. 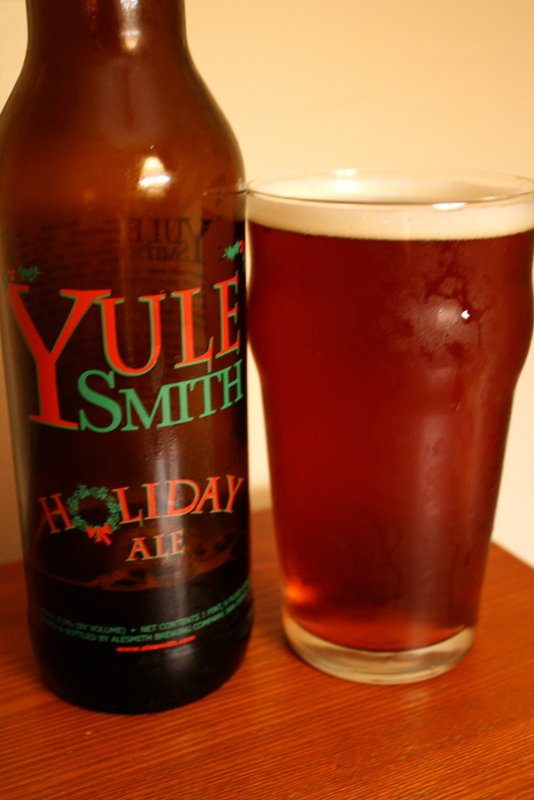 Yule Smith is 9.5% ABV, and doesn’t mask the booze at all. The alcohol is present throughout, fairly sweet and pretty hot. For being so high in alcohol and so sweet Yule Smith does finish fairly dry, it’s not the driest beer you’ll ever have but the sweetness doesn’t stick around too long. For some strange reason (that I haven’t really been aware of until now) I often pass up Green Flash’s Double Stout, a 8.8% ABV Double (Imperial) Stout in favor others. I’m not really sure why that is, Silva Stout, the bourbon barrel-aged version of Double Stout that was first released last year was probably my favorite new beer to come out of a San Diego brewery in 2010, but for some reason I passed over Double Stout regularly when looking to drink a bigger stout. Thankfully I picked one up recently and won’t be neglecting it any more. Double Stout isn’t the biggest stout around, many Imperial Stouts are coming in upwards of 10% these days, but it is insanely drinkable. Double Stout is 45 IBU, but I don’t think many people would describe it as hoppy. It has a fair amount of roasty bitterness, but think dark chocolate instead of coffee. Green Flash uses oats in the grain bill to give it a smooth, creamy mouthfeel which I think adds to the chocolate comparison. In addition to the dark chocolate roastiness there’s also some toasted malt flavors, not a grainy texture but tasting like toasted grains. This all adds up to a nice rich and easy to drink stout. Double Stout comes in 4 packs (12 oz bottles). I picked this bottle up at Bottlecraft as a single for $2.05, well worth the price (that’s the equivalent of a $3.75 22oz bomber). 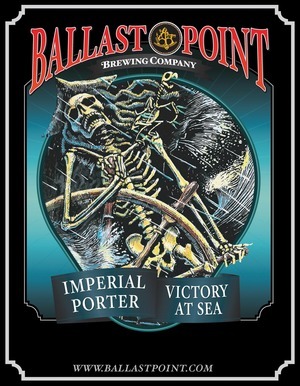 The most recent release of Ballast Point’s Victory at Sea (an Imperial Porter with coffee and vanilla) is my favorite batch yet. It’s a big beer, 10% ABV, but it’s dangerously easy to drink. Past years releases of Victory at Sea have always been good, but there’s something about this one that’s just great. Ballast Point uses cold brewed coffee from Caffe Calabria in North Park and the roasty coffee seems to come through much more than I remember it previously. The vanilla is still present, and comes through mid sip along with some chocolate like flavors. There isn’t much hop bitterness, far more coffee roastiness, and the alcohol is there but pretty well hidden. Like I said it’s dangerously easy to drink. Coffee flavor in beer can fade rather quickly. But big dark beers like this can age wonderfully. I highly recommend picking up a few bottles and drinking some fresh and aging some if that’s your thing. And be on the look out for Bourbon Barrel-aged version of Victory at Sea on draft popping up around town (especially at Ballast Point’s two locations) every once in a while. Typically Victory at Sea is released once per year and usually sells out pretty quickly. I picked up a few 22oz bottles at Bottlecraft for $7.75 each (which I’m pretty sure was cheaper than buying at the brewery). Worth every penny. Last week I was a guest on KPBS Midday Edition, along with Stone Brewing World Bistro and Gardens pastry chef Andrew Higgins, we talked about some of the things going on during San Diego Beer Week. KPBS put up a blog post about it and you can listen to the segment on that same page. 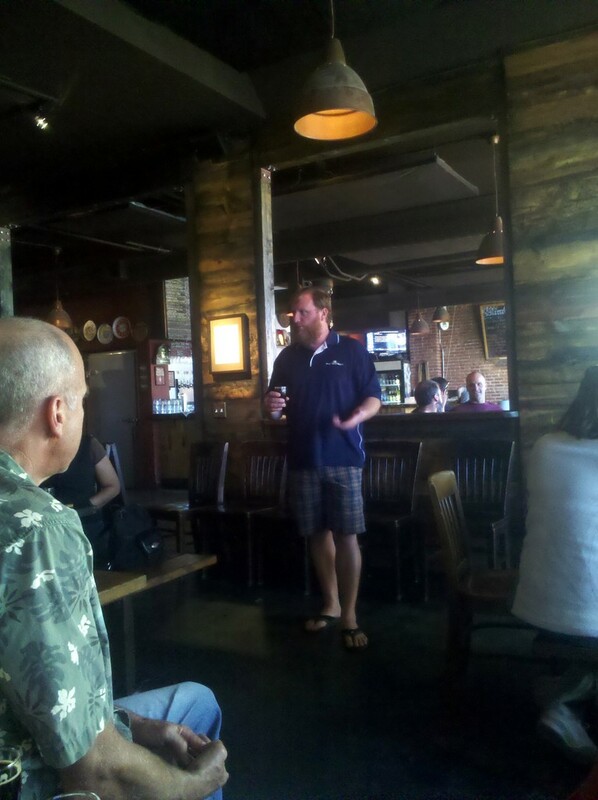 Tomorrow around 6pm (or today, Wednesday 11/9 if you’re reading this in your email) I’ll be on an NBC San Diego/Voice of San Diego segment called San Diego Explained about San Diego’s beer industry. 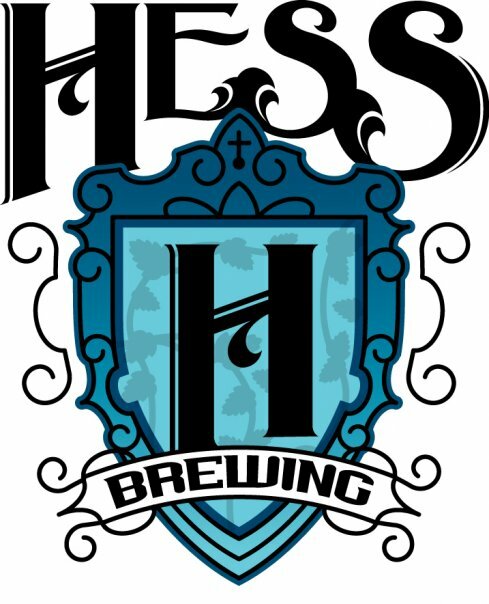 I’m not sure exactly what will be discussed, and I think my interview will be a small part of the larger overall segment, but it should be interesting, even to people that know quite a bit about our local beer community.